Listen to this track by serial hit single pure pop vocalist and future Solid Gold/Psychic Friends Network TV personality Dionne Warwick. 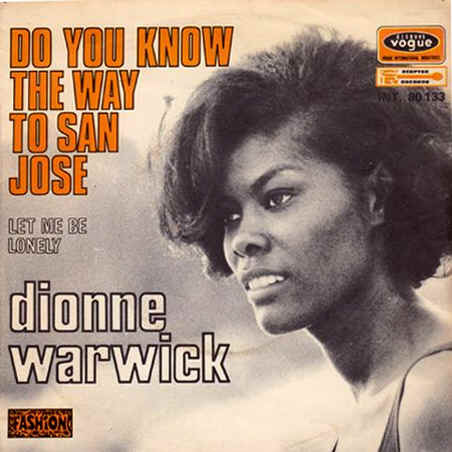 It’s “Do You Know The Way To San Jose”, her ginormous 1968 hit song as written by herculean songwriting team Burt Bacharach and Hal David with whom Warwick famously collaborated during the 1960s and into the early seventies. The song appears on her LP Dionne Warwick in the Valley of the Dolls. Lyricist David penned the words to this song after Bacharach wrote the melody. He decided to write about the town of San Jose, California where he’d once been stationed in the navy, having good memories of his time there. Warwick was initially unconvinced of the song’s hit potential. After all, she was following up “I Say A Little Prayer”, yet another huge smash hit, so the pressure was on. Bacharach and David convinced her to record it anyway, and it scored her a third consecutive number one song on the Billboard charts. Even after decades of performing it, and despite the success it represented for her, Warwick never really warmed to it. She considered it to be fluff. Yet, this song isn’t all that it seems. It’s one of those songs that sounds happy, but isn’t, full of all kinds of pain and heartache under its supremely breezy exterior. Even if Hal David wrote this song as a tribute to his memories spent in the titular city, this isn’t exactly the straightest line to get there. This song isn’t just a musical travel brochure that it might seem on first listen. Bacharach’s music that’s characterized by his patented playfulness with time signatures and shifting Brazilian-influenced rhythms draws one’s attention away from the underlying story to be found in David’s text. This song moves from starry-eyed fantasy to cold reality all in the space of three minutes. It is the story of a hopeful who longs for the bright lights of a bigger city far away, who finds that life in that place is inhospitable forcing a return to the home she knew as her dreams turn to dust. In this song, fame is a “magnet that draws you far away from home”, an irresistible force for those who have a dream in their heart to make a name for oneself. The promise of a week or two, and then the achievement of stardom turns into years, quickly passing and faster than one thought. Then, friendless, it’s time to return home for some peace of mind, or the hopes of it. In the end, this is not a song of celebration. It’s a song of retreat, disappointment, and cynicism, even if it doesn’t sound that way. The final line “I can’t wait to get back to San Jose” is intriguingly ambiguous. Is the narrator really relieved to be out of the great big freeway that is L.A? Or, are they kidding themselves that life in their hometown is good enough for her in exchange for her lost dreams of fame? The music seems to suggest the latter to me. It’s interesting that Warwick found this song to be too light to be taken seriously. It’s as if even she was distracted by the jubilant woah-woah woah-woahs, and la-la-las that make “Do You Know the Way to San Jose” sound so summery and light as air. Maybe it was because she was a rising pop star with a string of hits to her name, insulated from the story that this song tells by the time she came to record it; that fame seekers are a just one car each on a vast highway, more often than not ending up parking cars and pumping gas instead of racing forward to catch the fame-game prize. Alternatively, maybe she acknowledged the darkness at the center of this song, put off by how arguably unsympathetic the music is to the story it’s telling. Who knows? Only Dionne Warwick, I guess. Warwick would have several hits after this one, working with Bacharach and David up until the early seventies at which time the songwriters’ partnership dissolved. She’d have a hit in 1974’s “Then Came You”, produced by Philly Soul magnate Thom Bell, and also featuring The Spinners who were on the cusp of a classic period at the time. Into the early eighties, she’d have a huge hit with “Heartbreaker”, written by the Bee Gees, and featuring Barry Gibb on backing vocals. That would be yet another song she didn’t particularly care for, somehow. Yet it too would be a huge hit. Another high point was her part in “That’s What Friends Are For”, a single to raise money and awareness of the AIDS epidemic by the mid-1980s, written by Bacharach and Carole Bayer Sager. All the while, her young cousin Whitney Houston was on her way to taking the charts by storm, as Warwick herself had done twenty years earlier. Fame would take its toll there, too, although in a different way. After a period as a TV personality, Warwick was back as a singer and performer by the early nineties. This song. “Do You Know The Way To San Jose” would continue to be one of her live staples, surrounded in breezy sixties nostalgia that added yet another layer to hide the disappointment and sense of defeat that lay at its center. Dionne Warwick is an active performer today. Learn more about her at dionnewarwickinternationalfanclub.com. A great singer. When I compiled my list of late ’50’s, early ’60’s tunes, I had several of her collaborations with Bacharach/David. Carlos Santana famously said he learned phrasing on guitar by listening to her sing. That’s an interesting tidbit, Jim. I wonder if it’s because so much of her singing seems to be rooted in Latin rhythms, at least to my ears.